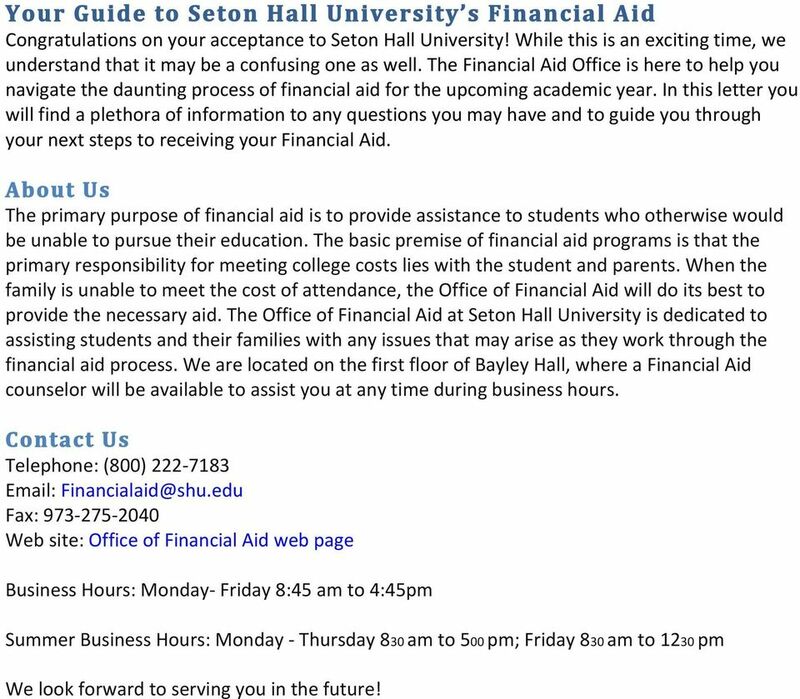 Download "Contact Us Telephone: (800) 222-7183 Email: Financialaid@shu.edu Fax: 973-275- 2040 Web site: Office of Financial Aid web page"
1 Your Guide to Seton Hall University s Financial Aid Congratulations on your acceptance to Seton Hall University! While this is an exciting time, we understand that it may be a confusing one as well. The Financial Aid Office is here to help you navigate the daunting process of financial aid for the upcoming academic year. In this letter you will find a plethora of information to any questions you may have and to guide you through your next steps to receiving your Financial Aid. About Us The primary purpose of financial aid is to provide assistance to students who otherwise would be unable to pursue their education. The basic premise of financial aid programs is that the primary responsibility for meeting college costs lies with the student and parents. When the family is unable to meet the cost of attendance, the Office of Financial Aid will do its best to provide the necessary aid. 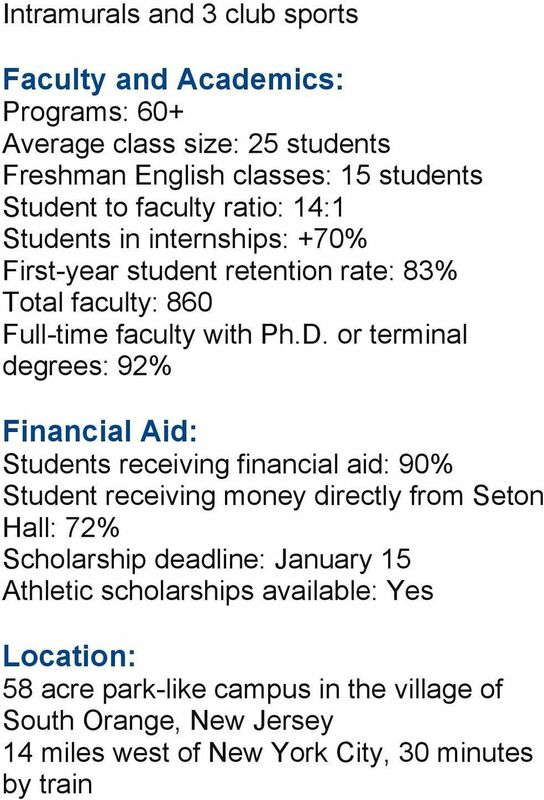 The Office of Financial Aid at Seton Hall University is dedicated to assisting students and their families with any issues that may arise as they work through the financial aid process. We are located on the first floor of Bayley Hall, where a Financial Aid counselor will be available to assist you at any time during business hours. Contact Us Telephone: (800) Fax: Web site: Office of Financial Aid web page Business Hours: Monday- Friday 8:45 am to 4:45pm Summer Business Hours: Monday - Thursday 830 am to 500 pm; Friday 830 am to 1230 pm We look forward to serving you in the future! 4 eligible for an additional Unsubsidized Loan of up to $4,000 for the first and second years and up to $5,000 thereafter. However, a parent must apply and be denied each year. Alternative Loans Additional private loans, generally referred to as alternative loans, are also available to students to bridge any funding gaps. Most students will need a co- borrower. Payment can usually be deferred until after graduation, but interest accrues from the time the loan is disbursed. 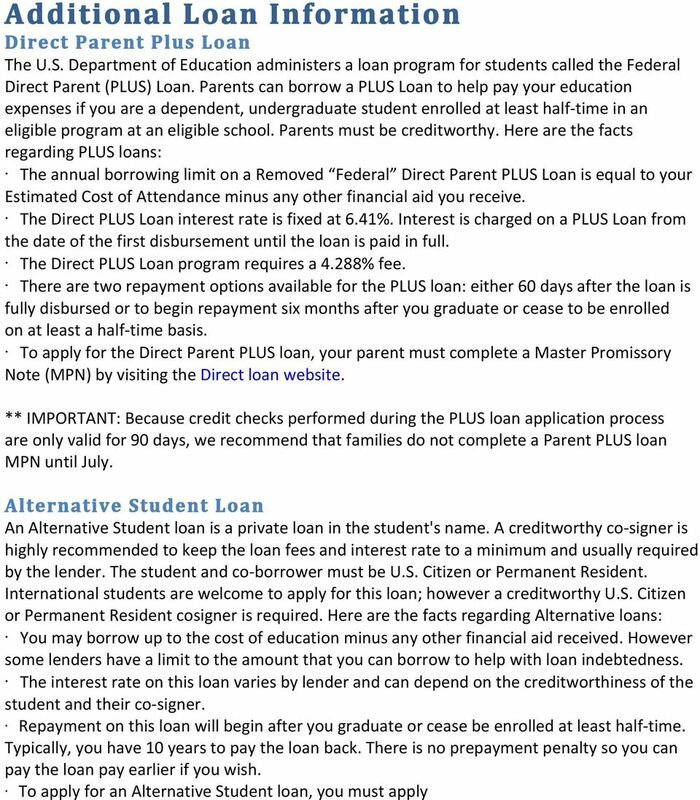 Additional information on this type of loan is available by visiting Private Student Loan Information. 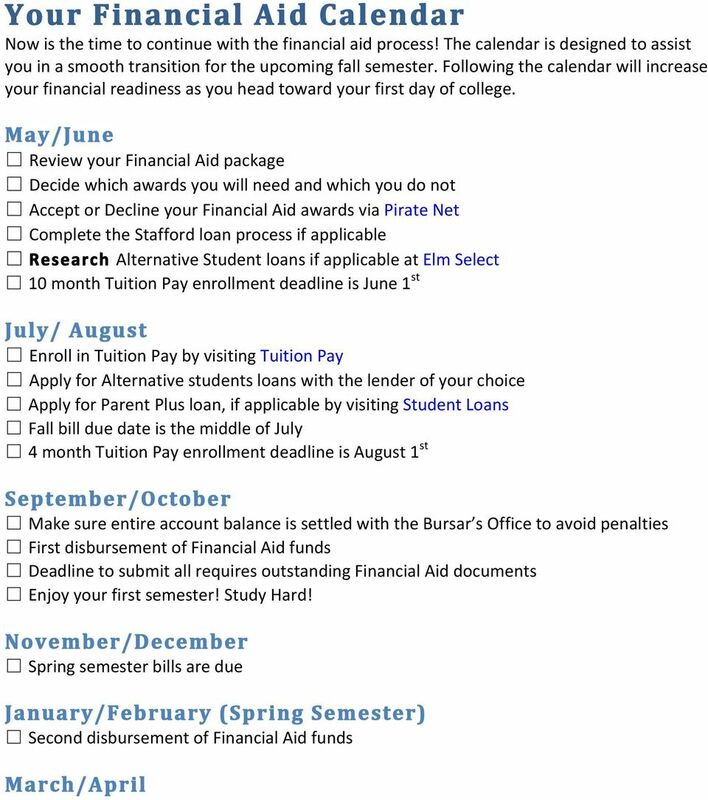 Office of Tuition Payment Plan Seton Hall University offers a deferred payment plan that provides you with flexibility and time to meet your financial obligation. The monthly payment plan is administered in conjunction with the Bursar s Office. The tuition payment plan is an interest- free option that breaks down the large lump sum payments due at the beginning of each semester into easy- to- manage installments. The plan is typically spread over a few months starting in July. Additional information on the payment plan can be found by visiting Tuition Pay. If you select this option, there is an enrollment fee due with your first payment, but no interest accrues and no additional fees are charged. 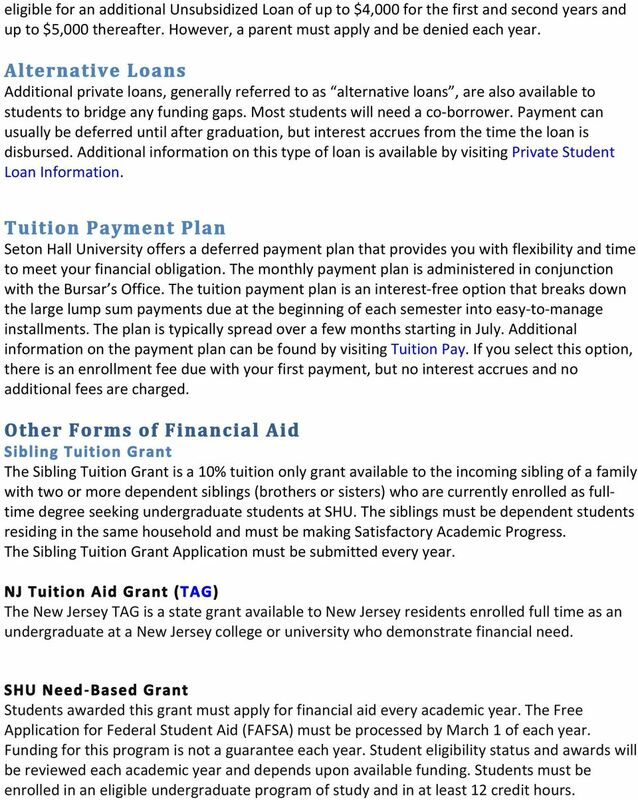 Other Forms of Financial Aid Sibling Tuition Grant The Sibling Tuition Grant is a 10% tuition only grant available to the incoming sibling of a family with two or more dependent siblings (brothers or sisters) who are currently enrolled as full- time degree seeking undergraduate students at SHU. The siblings must be dependent students residing in the same household and must be making Satisfactory Academic Progress. The Sibling Tuition Grant Application must be submitted every year. NJ Tuition Aid Grant (TAG) The New Jersey TAG is a state grant available to New Jersey residents enrolled full time as an undergraduate at a New Jersey college or university who demonstrate financial need. Office of Financial Aid SHU Need- Based Grant Students awarded this grant must apply for financial aid every academic year. The Free Application for Federal Student Aid (FAFSA) must be processed by March 1 of each year. Funding for this program is not a guarantee each year. Student eligibility status and awards will be reviewed each academic year and depends upon available funding. Students must be enrolled in an eligible undergraduate program of study and in at least 12 credit hours. 6 FAFSA priority filing deadline is March 1st! May/June Summer Financial Aid applications due May 1st Receive Financial Aid Package The Verification Process Federal Verification Verification is a review process in which the Financial Aid Office is directed by the Department of Education to determine the accuracy of the information provided on a student's FAFSA application. 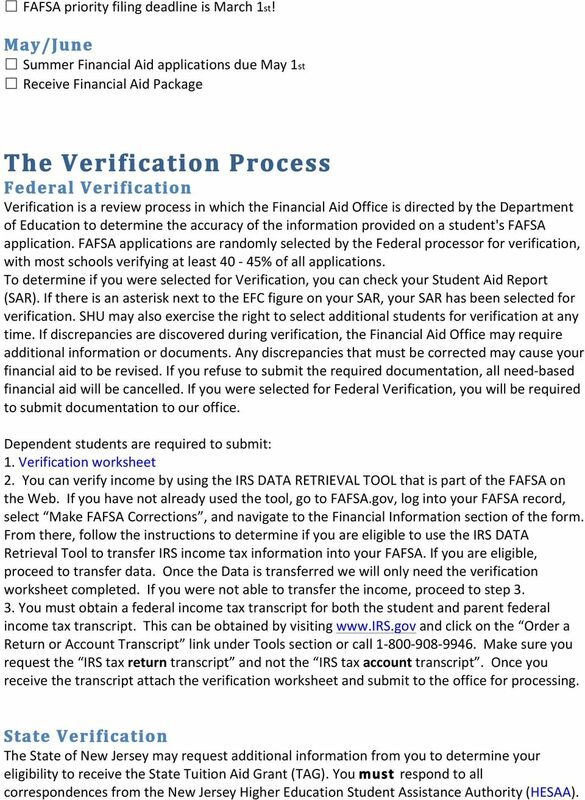 FAFSA applications are randomly selected by the Federal processor for verification, with most schools verifying at least 40-45% of all applications. To determine if you were selected for Verification, you can check your Student Aid Report (SAR). If there is an asterisk next to the EFC figure on your SAR, your SAR has been selected for verification. SHU may also exercise the right to select additional students for verification at any time. If discrepancies are discovered during verification, the Financial Aid Office may require additional information or documents. Any discrepancies that must be corrected may cause your financial aid to be revised. If you refuse to submit the required documentation, all need- based financial aid will be cancelled. If you were selected for Federal Verification, you will be required to submit documentation to our office. Dependent students are required to submit: 1. Verification worksheet 2. You can verify income by using the IRS DATA RETRIEVAL TOOL that is part of the FAFSA on the Web. If you have not already used the tool, go to FAFSA.gov, log into your FAFSA record, select Make FAFSA Corrections, and navigate to the Financial Information section of the form. From there, follow the instructions to determine if you are eligible to use the IRS DATA Retrieval Tool to transfer IRS income tax information into your FAFSA. If you are eligible, proceed to transfer data. Once the Data is transferred we will only need the verification worksheet completed. If you were not able to transfer the income, proceed to step You must obtain a federal income tax transcript for both the student and parent federal income tax transcript. This can be obtained by visiting and click on the Order a Return or Account Transcript link under Tools section or call Make sure you request the IRS tax return transcript and not the IRS tax account transcript. Once you receive the transcript attach the verification worksheet and submit to the office for processing. 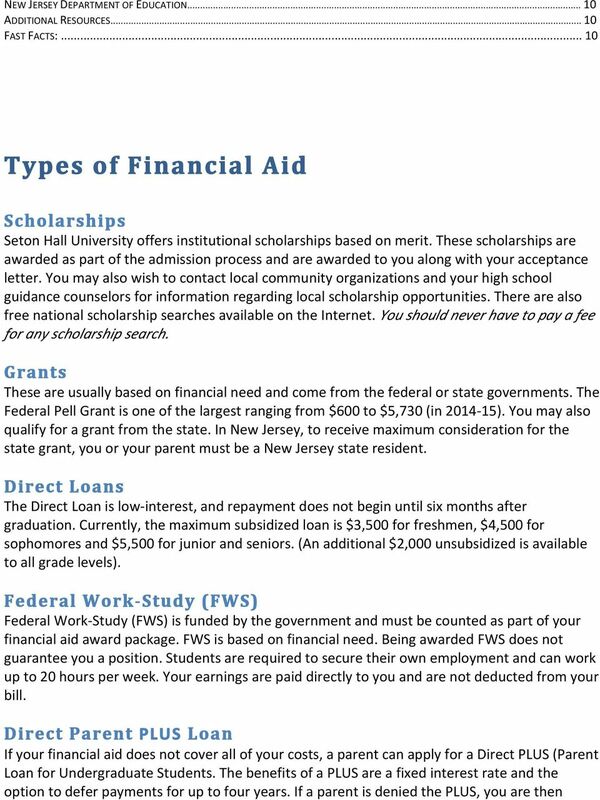 State Verification The State of New Jersey may request additional information from you to determine your eligibility to receive the State Tuition Aid Grant (TAG). You must respond to all correspondences from the New Jersey Higher Education Student Assistance Authority (HESAA). 7 Your State grant eligibility cannot be determined until this information is provided, so please promptly respond to all requests from NJHESAA. All students who are eligible to receive state aid must complete the Applicant Information Request forms from HESAA, regardless of verification status. Any questions regarding state verification should be directed towards HESAA at The Federal Work Study Process (FWS) The Federal Work- Study Program (FWS) is maintained by the Office of Student Employment. FWS is a federal financial aid program that provides part- time jobs for undergraduate students. Jobs are available both on and off campus. The program encourages community service work and work related to the recipient's course of study. Students who are eligible for Federal Work Study will receive an notification from the Office of student Employment. If you are not eligible for FWS, you may still apply for Departmental work study online. Jobs listings for the upcoming academic year are available after July 1. To check and apply for these positions please visit the Employment Opportunities web site. 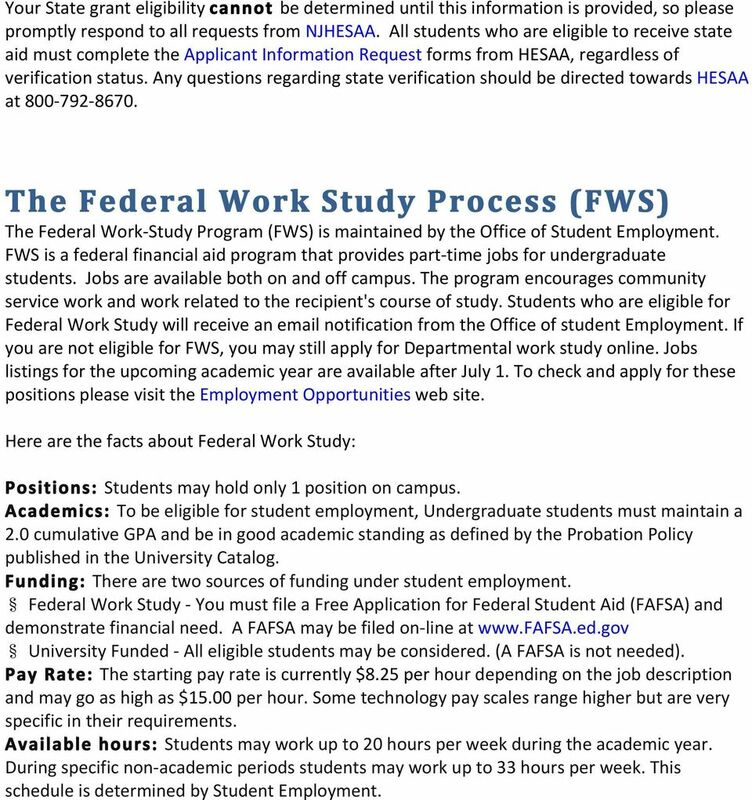 Here are the facts about Federal Work Study: Positions: Students may hold only 1 position on campus. Academics: To be eligible for student employment, Undergraduate students must maintain a 2.0 cumulative GPA and be in good academic standing as defined by the Probation Policy published in the University Catalog. Funding: There are two sources of funding under student employment. Federal Work Study - You must file a Free Application for Federal Student Aid (FAFSA) and demonstrate financial need. A FAFSA may be filed on- line at University Funded - All eligible students may be considered. (A FAFSA is not needed). Pay Rate: The starting pay rate is currently $8.25 per hour depending on the job description and may go as high as $15.00 per hour. Some technology pay scales range higher but are very specific in their requirements. Available hours: Students may work up to 20 hours per week during the academic year. During specific non- academic periods students may work up to 33 hours per week. This schedule is determined by Student Employment. 8 The Direct Loan Process Direct Loans are low- interest loans for students and parents to help pay for the cost of your college education. The lender is the U.S. Department of Education (DOE) rather than a bank or other financial institution. If you choose to use your Direct Loans for the academic year, you must complete Direct Loan Entrance Counseling and sign a Master Promissory Note. Here are the facts regarding Direct Loans: Direct Subsidized Loans for undergraduates have an interest rate of 3.86%. Direct Unsubsidized Loans for all students have an interest rate of 3.86%. The Direct Loan Program offers loan repayment plans designed to meet the needs of almost every borrower. Borrowers may choose from the standard, extended, graduated, income contingent, or the income- based repayment plan. Students must complete Direct Loan Entrance Counseling in order to receive the loan disbursement. Loan Entrance Counseling allows you to understand your rights and responsibilities as a loan borrower. For complete step- by- step instructions on how to complete Loan Entrance Counseling, please visit the guide to completing Entrance Counseling. Students must also complete a Master Promissory Note (MPN). The MPN is a legal document in which you promise to repay your loan(s) and any accrued interest and fees to the Department. It also explains the terms and conditions of your loan(s). For complete step- by- step instructions on how to sign your MPN, please visit the guide to signing your MPN. In most cases, once you've submitted the MPN and it's been accepted, you won't have to fill out a new MPN for future loans you receive, you can borrow additional Direct Loans on a single MPN for up to 10 years. 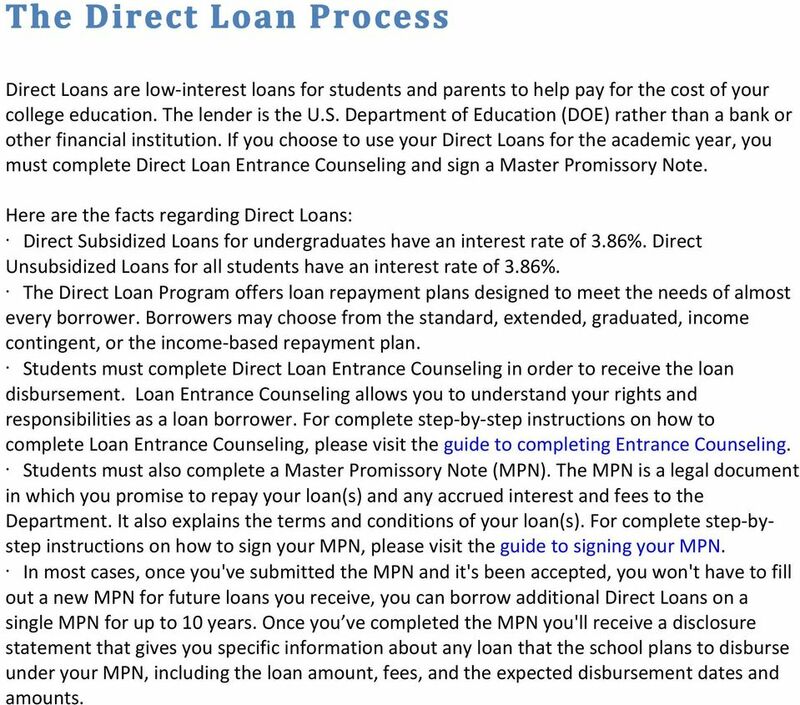 Once you ve completed the MPN you'll receive a disclosure statement that gives you specific information about any loan that the school plans to disburse under your MPN, including the loan amount, fees, and the expected disbursement dates and amounts. Please contact the Office of International Student and Scholars Services for more information (www.temple.edu/isss/). facebook.com/saicsfs twitter.com/saic_sfs Cover Image: José Vilchez, detail, 2014. Financial Aid Award Guide Understanding Your Assumption College Award & Choosing the Best Way to Finance Your Assumption Education 2015-2016 ASSUMPTION COLLEGE Worcester, Mass Rome, Italy Light the way. Financial Aid at. To our students and their families: What is need-based financial aid? Who should apply for financial aid? 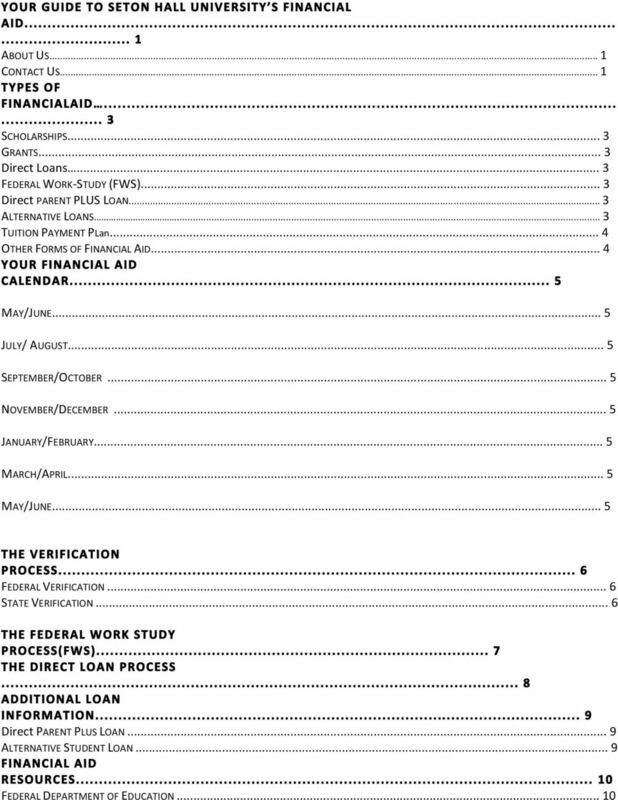 A Guide to Financial Aid 2015-16. The bottom line and how to pay for it.